If you read my race recap about the half-marathon I ran this summer you saw that I made some motivational tattoos for my cousin and me to wear. It was the first time I used the Silhouette brand Temporary Tattoo paper, but I knew that I would be using it again the following month for Sid’s birthday party. I ran into a few issues as a first time user and thought I would share them, in hopes that other’s don’t have the same troubles. I sized out the space on my arm and made a box in Silhouette Studio. I then typed out my sayings and changed the fonts, sizes and colors for specific words. 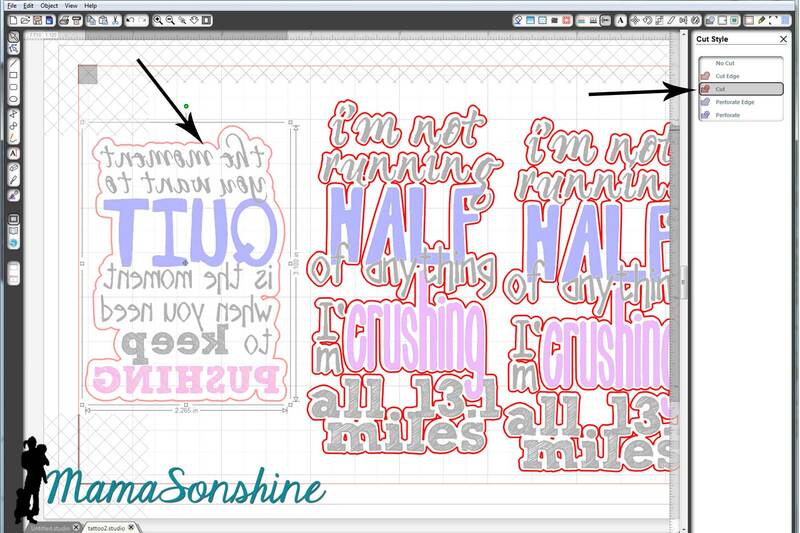 I then used the offset tool to create my cut lines around the words. Remember, anything that is white in your design will be clear on the tattoo, and your skin will show through. My first instinct was to make a close-in offset, as I would when cutting other media. Here is the problem: when you cut it, it cuts through the paper backing. So now you have all the words in different pieces that you would have to place on your arm individually. So again, remember that the tattoo paper is clear, and make your offset big enough that all the words cut as one piece. select all the unwanted parts, then delete them. Now you are left with a nice group of text that will stay together once cut. Check out your cut lines, make sure you are not cutting out the words you are printing, but just the offset you just made. Once you have your design and cut lines all set, flip your image horizontally. This is very important when doing something with words, or your words will be backwards. The key to the temporary tattoos is Silhouette‘s print and cut feature using the software’s registration marks. I don’t know about you, but when I print and cut, I change the paper to ‘letter’ (because that is the size of the paper I print on) and adjust my registration mark settings to the smallest available. One day when I was printing something small I realized I don’t have to waste the whole piece of paper. I say ‘waste’ because once I printed the registration marks, I couldn’t reprint (for cutting) on that same piece of paper. So I changed the size of the paper, I know it seems like a simple statement. But I made the paper size just larger than my image size, with the registration marks, and that left the rest of the paper blank, for use again! So simple, yet so helpful. The tattoo paper is a bit pricey, about five bucks a sheet; the pack comes with two sheets and is priced at $9.99. You can find it on sale at Amazon, and sometimes through Silhouette. I didn’t want to waste any of the paper, and I wasn’t ready to print out the favors for Sid’s party, so I just adjusted the size of the paper to fit my quotes. That way I still had half a sheet of unprinted paper I could use again. Here is where I had the main problem that I really didn’t want to admit to anyone. It’s a little embarrassing. I opened the pack of tattoo paper and pulled out the first sheet on top. The instructions say to print on shiny side then peel of green backing to apply adhesive material. So I printed on the shiny side. My ink wouldn’t dry. I left it while I went to work, when I got home it still wasn’t dry. I wiped it off, tried different print settings, still wouldn’t dry. I googled instructions looking for a video tutorial. Finally when watching my second video I wondered why their paper was white when my paper was clear with a green paper backing…. I went back to the package and looked inside it. Behind the two pieces of clear paper with green backing was two pieces of white paper with a shiny side. Start over. Printed on the shiny side of the white paper, and ink came out dry and sharp. Followed directions by adding the adhesive layer. That is the clear paper with the green backing that I was trying to print on first. Because I wasn’t using the whole sheet of paper, I used a paper-cutter to trim down both the white sheet and the clear adhesive sheet before joining them. Then used my Silhouette to cut out the tattoos. They look great and just the motivation we needed. Now that I am a pro at the temporary tattoos, I made some as favors for Sid’s party. However, I neglected to flip the image horizontally, so the words were backwards. There is always something with me, right? I decided to let it ride (yep, pun intended) as the guest were toddlers who really couldn’t read anyway. I am already planning my tattoos for my Halloween costume! Categories: Fitness, Run, She's Crafty, Silhouette Crafts | Tags: diy, DIY Temporary Tattoos, Do it yourself, Hand Made Gifts, Paper, Silhouette, Silhouette America, Silhouette Art, Silhouette Cameo, Silhouette Crafts, Silhouette cutting machine, Silhouette Gift Bags, Silhouette Ideas, Silhouette Print 'n Cut, Silhouette Print and Cut, Silhouette Stencil, Silhouette Studio, Silhouette Studio Software, Silhouette Studio Tutorial, Silhouette Temporary Tattoos, Silhouette Tips 'n Tricks, Tattoo, Tattoo Design, Tattoo Paper, Temporary tattoo, Temporary Tattoo Paper, Tips for Temporary Tattoos | Permalink. You did a great job. I have a friend running the Chicago Marathon and I might print him up some inspiring tattoos. Ohmygoodness, I did exactly the same thing when I first used the tattoo paper! Thanks for sharing (since you & I can’t be the only ones, right?) and helping everyone else out!